I would like to take a brief minute to thank you for asking your Assistant Director of Citizens Services to write me a letter in response to my multiple requests regarding the status of SB116 [AKA: Constitutional Carry]. 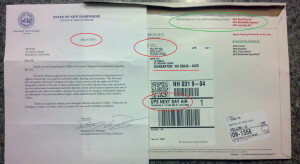 The letter was drafted on the 16th and arrived yesterday (6/19) to my house. In this letter, Mr. Belanger writes that “Governor Hassan supports the Second Amendment and believes Americans have the right to responsibility own guns for personal safety, hunting and recreation.” I am glad that you believe in the Second Amendment and I look forward to standing with you when you sign this bill. My concern with this letter is not just the content, as I can address your concerns in a separate letter, my issue with the letter is over the use of taxpayer monies to mail the letter to my home. Although State Reps. do not have offices at the State House, we do have mail boxes located on the 2nd floor just steps from your office. My concerns stem from the costs associated with mailing the letter. Recently, there has been much press regarding the potential threat to veto the budget, HB1 and HB2, because of concerns regarding the state finances and the use thereof. Therefore, I am concerned that spending money to mail the envelope UPS NEXT DAY AIR to my house only 11 miles away was a bit extravagant. While I am honored that your staff felt that I needed to see this letter quickly, I think mailing overnight is a bit “over the top”. For what it is worth, it seems that it took 2 days to get from the printer to the mail room in the basement as the letter was mailed on the 18th, to be then sent overnight to my home. Maybe the effort should have been placed in getting the mail to the mail room instead. 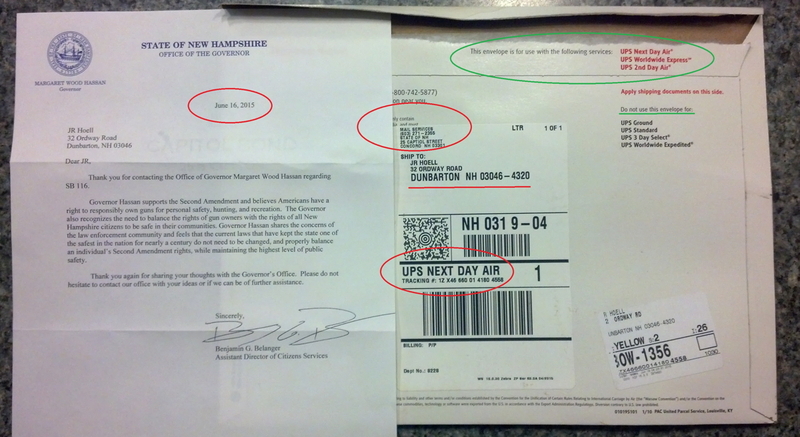 I hope that you will take the time to explain to me and the other NH citizens how spending potentially $36 to mail a letter to a State Rep is an effective use of taxpayer funds. I think we both realize that there would not have been significant cost or effort to walk the letter to my State House mail box only steps away saving this money for more valuable state obligations. Thank you again for you kind attention to this matter, I look forward to hearing back from you regarding the costs involved in sending out this letter. Enclosures: Photos of the letter and the UPS research to determine the costs and the tracking information.